Quilt Petite: 18 Sweet and Modern Mini Quilts and More is the delightful new book by Sedef Imer of Down Grapevine Lane (one of my most favourite blogs to visit) and published by Tuva Publishing. In her debut book, Sedef has created 18 super sweet projects to sew, embroider, appliqué and paper piece. Each project has the most gorgeous photograpy and is beautifully illustrated with step by step instructions. Honestly, the most difficult thing about creating one of Sedef’s projects, is choosing which one to make first! To help my decide which project I’d like to start with, I enlisted the help of my little girl. We flicked through the book a number of times, oohing and aahing as we went. Finally, she decided that we should make the Hexie Doll Quilt (pg 35) for Sally. Sally (the unicorn) came to live with us 7 years ago. She was sitting in one of those big metal baskets at the post office (along with a bazillion other stuffed animals). She caught Amelia’s eye and it was love at first sight. Amelia picked up Sally and has cuddled her to sleep every night since then. 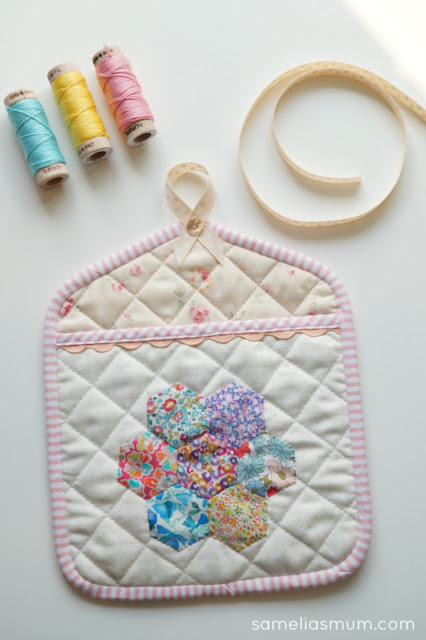 The Hexie Doll Quilt is a fun project to create. The hexies are 1.5” so they’re great for using fun prints. I used Toy Chest by Penny Rose Fabrics to create the doll quilt (sleeping bag). It’s a great mix of cute retro prints and colours and perfect for fussy cutting. And so that none of her other toys could get up in the middle of the night and mistake the beautiful new quilt for their own, we even added a name label to the lower corner. So... now that I’d make a project for Amelia, it was time to choose a project for me. I have a “thing” for hexies, so chose the Flower Potholder to make. This time, the hexies are much smaller than in the Hexie Doll Quilt at only 3/4”. I used some pretty Liberty fabric scraps for the hexagons and got to play with my vast supply of ric rac. Honestly, I have jars and jars filled with ric rac (another weakness). There have been lots of great projects created in the Quilt Petite Blog Hop already… and a few more still to go. Visit the following blogs to see what everyone has made and don’t forget to visit Down Grapevine Lane for the fantastic giveaway. Purchase Quilt Petite from Amazon by clicking the image below which is my affiliate link. Can you see Sally's mum out in the garden, keeping an eagle eye on what was happening?